Over the past few months there has been a lot of discussion in this space about the intensified campaign against "Islamophobia", which is being orchestrated by the Organization for Islamic Cooperation and promoted through various trans-national bodies by Islamic groups and their allies among left-wing NGOs. The International Civil Liberties Alliance (ICLA) is spearheading the pushback against the term "Islamophobia", which is now being used in legal action against politically-chosen targets without ever being properly defined. ICLA notes with great concern the ongoing OIC campaign, using the pretext of "Islamophobia", to control the media and to stifle freedom of expression, as seen recently at the OIC conference The First International Conference on Islamophobia: Law & Media, Geneva, September 2013. [T]he OIC requests that the media censor their reports about Islamic terrorism, Islamic persecution of religious minorities and human rights violations committed in the name of Islam, as an interim step toward the criminalization of such speech. All of this will only serve to increase, not decrease "Islamophobia." Quite surprisingly, the Istanbul Process is accepted and even endorsed by the US State Department, as outline by Secretary of State Hillary Clinton in her speech to OIC, September 15th 2011. Former CIA officer Clare M. Lopez has analyzed the implications of this in the article Islamic World Tells Clinton: Defamation of Islam Must be Prevented — in America. This campaign against "Islamophobia" is part of the OIC's ten-year plan to put an end to criticism of Islam and any activity that may show Islam in a bad light. 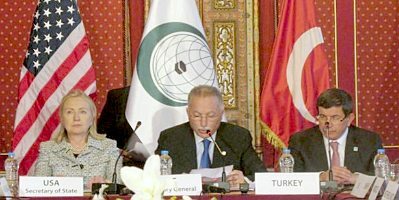 Already in 2008, the OIC plan was analyzed in detail at Gates of Vienna, The OIC's Crusade Against Islamophobia. A key tactic for that project is to create an impression that "Islamophobia" is rampant and out of control, and that government intervention is urgently needed. Reports on the phenomenon are published by several Islamic organisations, including the controversial American Islamic group CAIR. The OIC is pushing its concern over "Islamophobia" heavily. Apart from the efforts mentioned earlier to set up a "Media Advisory Board" for media guidelines (read "media control"), a similar set of Guidelines for Educators has been published through OSCE, the Organisation for Security and Cooperation in Europe, seeking to battle "Islamophobia" through the education system. Now, all of this is based on a concept that until recently was not even defined. A definition finally emerged, provided by Turkey at the OSCE conference Combating intolerance and discrimination against Muslims, Tirana, Albania, May 21-22 2013. Note that an OIC representative was directly involved in this definition. Since OIC has a vested interest in propagating the "Islamophobia is dangerous" meme, this does not represent sound practice. OSCE is a consensus-based organisation, so it would accept such a definition by default unless countered by others. Here is a NGO paper doing just that, protesting that the definition is fatally flawed, for a variety of independent reasons: What Does "Islamophobia" Mean? This is an abbreviated version of this more extensive analysis published previously by the International Civil Liberties Alliance, The Problematic Definition of "Islamophobia". The International Civil Liberties Alliance has concluded that the OIC-driven campaign against "Islamophobia" has little to do with its traditional role of working for human rights and individual liberty. Quite the contrary: the campaign appears to be a diversion from such fundamental and inalienable rights, seeking instead to set an agenda that confuses and obstructs such work, in order to weaken and undermine basic liberties that are central to the mission of OSCE and guaranteed by the Universal Declaration of Human Rights. The International Civil Liberties Alliance therefore calls upon Western governments and NGOs to do a critical analysis of any initiatives related to "Islamophobia", to reject any and all measures using the pretext of "Islamophobia" to gain control of the press, social media and other forms of expression. and in particular to protest any initiatives intended to grant special protections or privileges to groups based on their faith.